Take to the stars in the classic X-wing starfighter! This most iconic vehicle of the Star Wars universe returns to turn the tide in the battle against the evil Empire! Includes 4 minifigures: Luke Skywalker, Jek Porkins, R2-D2 and R5- D8. Take to the stars in the LEGO classic X-Wing starfighter! Featuring wings that fold into attack mode, proton torpedoes, retractable landing gear and opening cockpit, this most iconic vehicle of the Star Wars universe returns to turn the tide in the battle against the evil Empire! LEGO model number: 9493: Includes 4 minifigures: Luke Skywalker, Jek Porkins, R2-D2 and R5-D8. For ages 8 years and over; EAN: 5702014840898. WARNING(S): Not suitable for children under 3 years old. 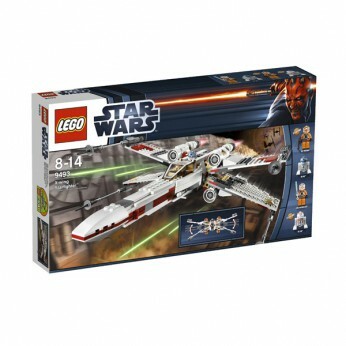 This toy costs approximately £38.99 (for the latest and best prices make sure you check our retailer list for the LEGO Star Wars X wing Starfighter 9493 above). In our review of LEGO Star Wars X wing Starfighter 9493 we classed it as being suitable for ages 6 years, 7 years, 8 years but recommend you check the manufacturer specific advice before purchasing.